Graz it without doubt one fine city and among my favourite in Austria - it has a historic core, a refreshingly studenty atmosphere and rich cultural offerings. Unfortunately, its surroundings are less diverse. Day-trips can take you to the "Oststeirisches Hügelland", the Eastern Styrian Hills. Here you find a few nice towns, a pleasant landscape with orchards and vineyards, some castles and thermal spas - but that′s pretty much it. If you plan to make Graz your base for day-trips, keep therefore in mind that you won′t see too much of Austria′s diverse landscapes and cultures. That being said, the Styrians are a hospital breed and the rural charms of the "green heart of Austria" are not bad at all. Distances can be rather vast, though, so travelling by your own mean of transport might be a good option. The "classic" day-trip from Graz takes you to the drop-dead boring village of Bärnbach, which has precisely one claim to fame: The parish church, which used to be just as boring as the rest of the village until hippie-artist Friedensreich Hundertwasser did a face-lift on it. Now the church is colourful, twisted, full of tiles and bizarre references to the World′s religions. If Michelangelo would have worked on LSD, this is what the Vatican would look like. Further on to the next village, horse aficionados can visit the stud at Piber. This is one of only two locations where the famous (?) Lipizzaner horses are bred. The other stud is in Ex-Austria-now-Slovenia, in the name-giving Lipicer. It is only the Piber stud, however, that supplies the Spanish Riding School in Vienna with horses. It is on the edge of Styria where you can find an aggregation of charming sights - historic small towns, orchard areas and castles. The village rather than town of Feldbach has a medieval core; the nearby Riegersburg castle is one of many possessions of the Princes of Liechtenstein, was once the venue of a big exhibition on witches - and fell asleep again afterwards. Nearby, you find the small Renaissance palace of Schloss Kornberg. Not far from Kornberg, you find another colour-massacre of Friendsreich Hundertwasser, the thermal spa of Blumau. Another sight is the small town of Hartberg. Here in the middle of the Eastern-Styrian hills you can explore the medieval town centre or some of the fortifications that recall the days of Turkish invasions. Hartberg is also a big centre for the legendary "Styrian Pumpkin Seed Oil". The church is worth a closer look, but generally, it is just a pleasant town to relax at. Going (almost) Slovenian, you should not miss the small towns of Leibnitz and Ehrenhausen. Both of them have a historic town centre and a the odd sight to offer - Ehrenhausen, for example, is mostly known for the mausoleum of the local landlords. Once again, this part of Austria is mostly known for good food, friendly people and rural charms - less so for sightseeing and urban delights. A real highlight of Southern Styria is the walled town of Bad Radkersburg; the community is an Austrian peninsula, more or less surrounded by Slovenia. The River Mur follows a course that matches with the industrial heartland of Styria, which has a long tradition in iron ore mining and all kinds of iron manufacturing. Interesting or attractive towns that are kind of within reach from Graz include Bruck an der Mur and Mürzzuschlag. More interesting are Leoben and Eisenerz, the centres of the iron ore mining - altogether with show mines and touristy entertainment at the Erzberg mountain. 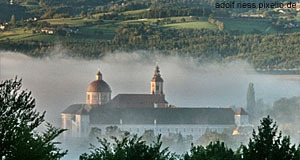 If you make it to Leoben, don′t miss out on Göss Abbey, a former Romanesque nunnery. The monastery and cathedral of Seckau make this town further West in the Mur Valley a very attractive destination. 7.) The "Road of Castles"
With dozens of castles all over Eastern Styria and the Southern parts of the Burgenland, the tourism authorities decided to arrange some for a theme-road. This was a good idea, since the area was economically not doing terribly well - and castles are pretty much the only thing they have beyond agriculture. I have covered the "Schlösserstraße" in detail in a separate article; have fun reading it. The only national park on Styrian territory makes a nice introduction to the Austrian Alps. Don′t expect the same degree of amazement that you could draw from the Alps in Vorarlberg, Tyrol or Salzburg - but especially for visitors that limit their stay to Styria, the Gesäuse is well worth a visit.